March Madness and Basketball Jersey Cookies Holy Hot Dog! Pretzel and Bacon Wrapped Hot Dogs. Bring the ballpark home to you! I used to have a problem. I had an obssession with watching baseball. In college I literallyÂ recorded every single Red Sox game I had to missÂ for class (silly classes alwaysÂ impeding fun activities). This was not recorded with a DVR. TAPED. This was 6-10 years ago, folks. I feel slightly old. Anyway, I thought this was normal. “Phhhhhhhh! Blasphemy!” He just doesn’t understand. Now that food has become my career, it only makes sense to channel my love of the game into a few recipes. Of course, I couldn’t just make anything ordinary. I don’t think I can ever go back to store-bought ice cream again. This ice cream is PERFECT. 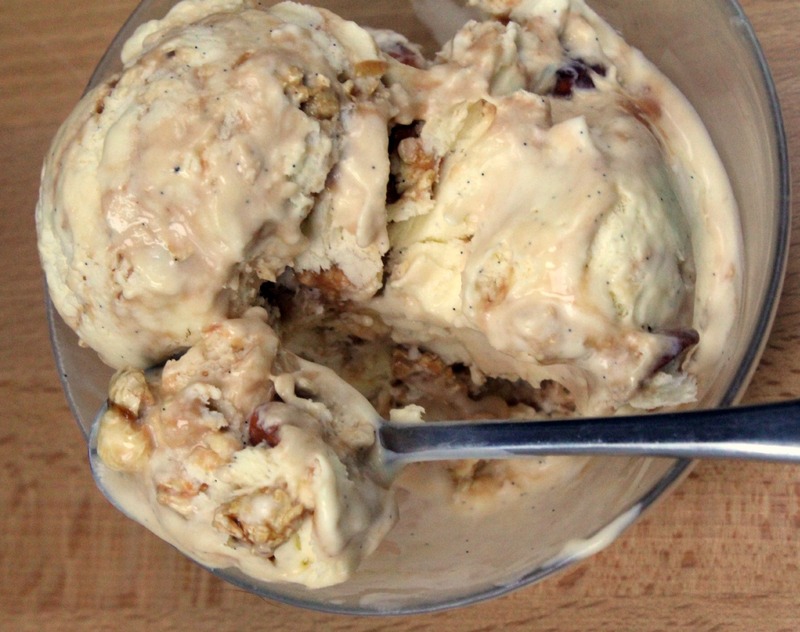 Lucky for you, this recipe of awesomeness does not necessarily require an ice cream maker. 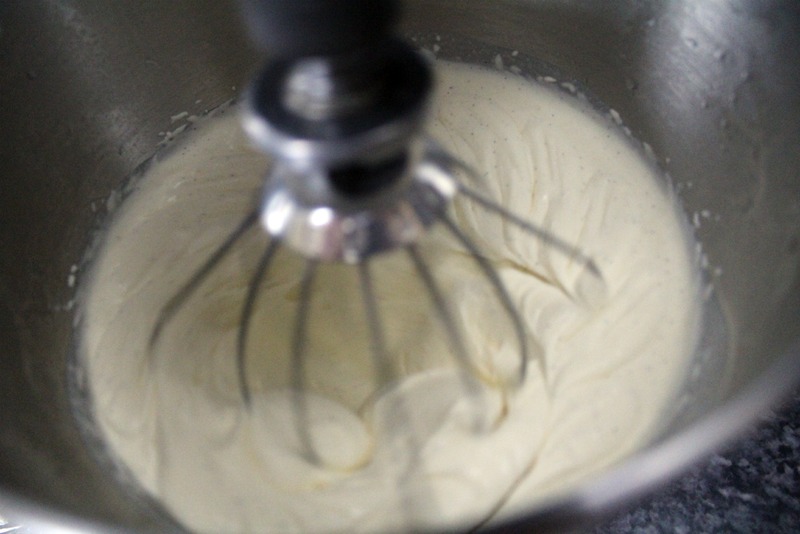 First I started with aÂ creamy vanilla ice creamÂ recipe that I adaptedÂ from The Perfect Scoop. Then I added some oomph for a little baseball nostalgia. 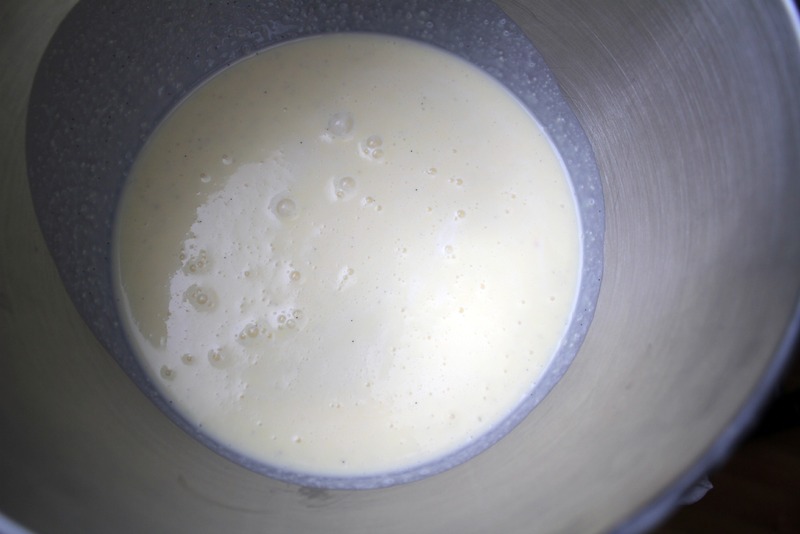 Start out with your whole milk, sugar, and salt. Heat it up in a sauce pan on medium to medium low. As it heats up, grab your vanilla. You have choices here. Don’t get me wrong, I use extract all of the time. Vanilla beans can be very pricey. When I use extract, though, it’s the GOOD stuff. The store brands (or just any cheap brand) makes me shudder. 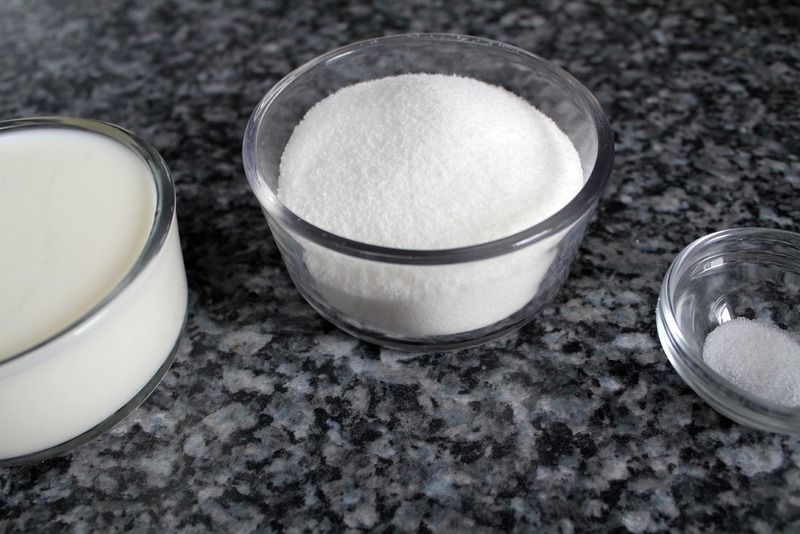 If you are going through the effort to make your own ice cream, use quality ingredients. Â Anywhoodles, back to the recipe. I’m certain you can guess that I picked the vanilla bean. 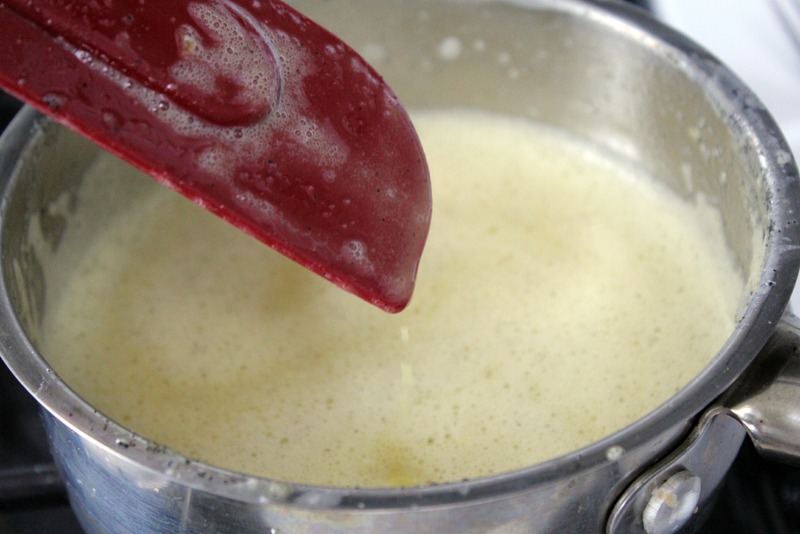 Cut the vanilla bean in half, then use a small knife to scrape theÂ tiny beansÂ into the pot. 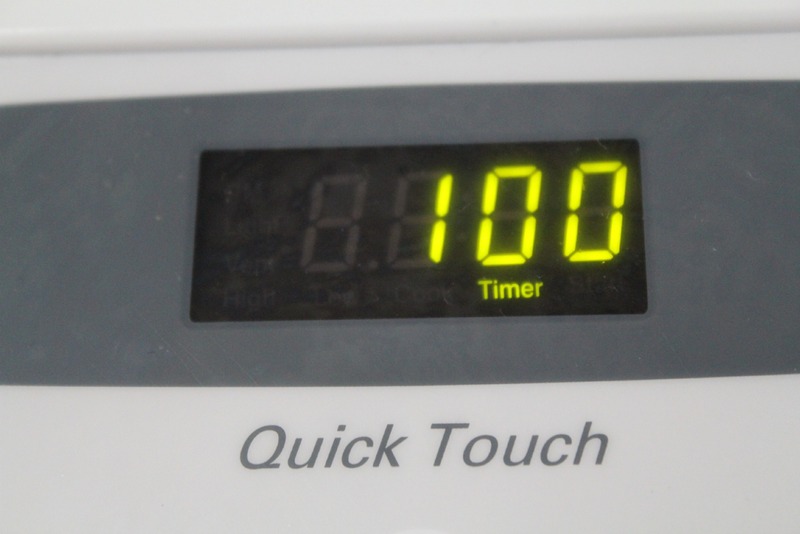 Remove your pot from the stove, cover it, andÂ let itÂ Â sit for one hour. 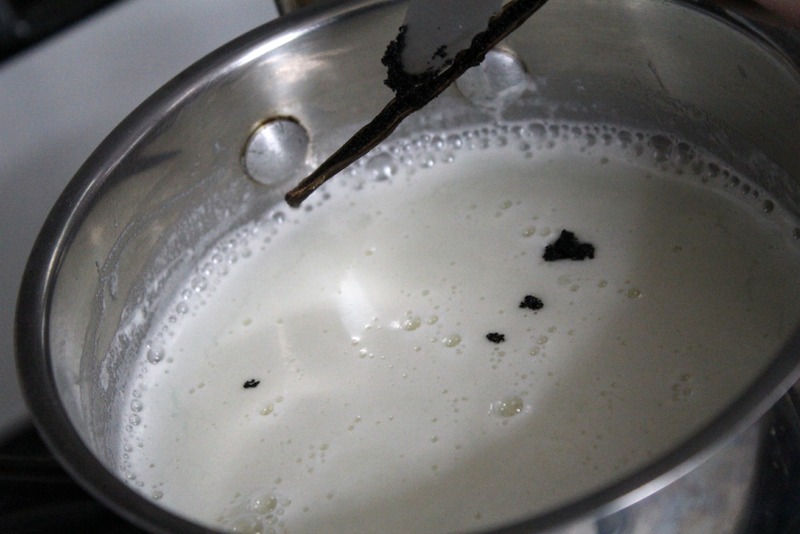 This helps the milk become infused with vanilla goodness. I like to use a timer, because I can barely remember where the car was last parked. 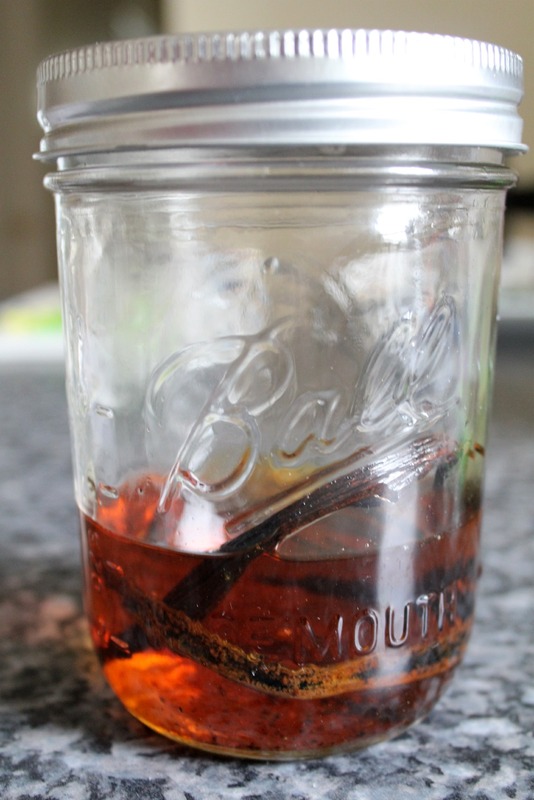 If you like, you can grab about 1/3 of a cup of rum or vodka and pour it into a jar. 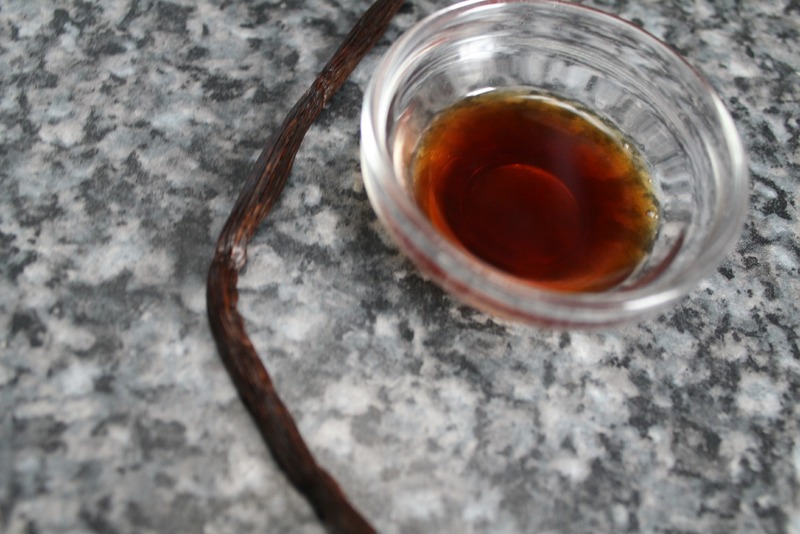 Put the leftover vanilla beans into the jar, completely immersing it into the alcohol. Store in a very dark place for about six months, adding additional leftover vanilla beansÂ at any time. Now set up an ice bath. 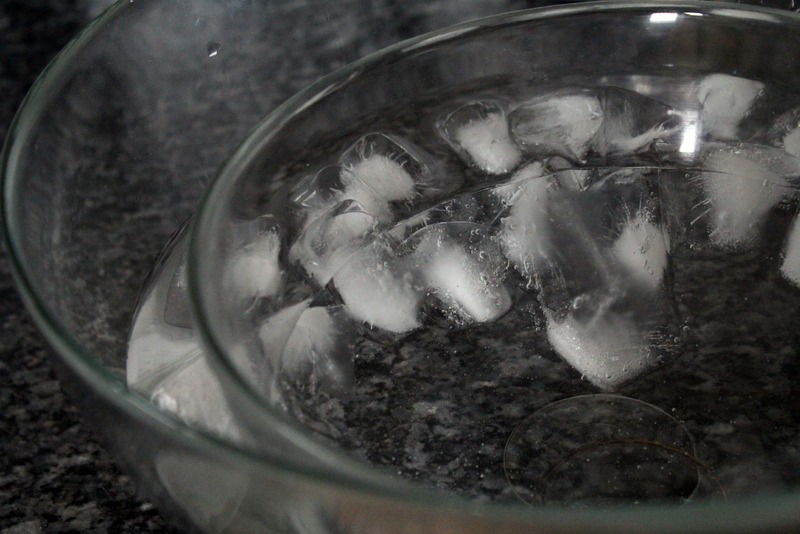 Large bowl, 1/3 filled with water and ice cubes. Medium bowl on top. 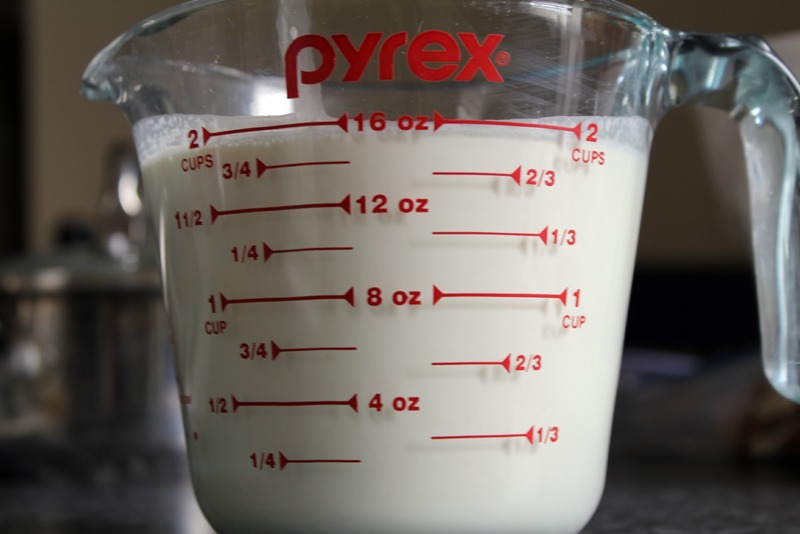 The medium bowl should hold about 8 cups (2 quarts, 1/2 gallon, 64 ounces, or equivalent to about two liters of cola). 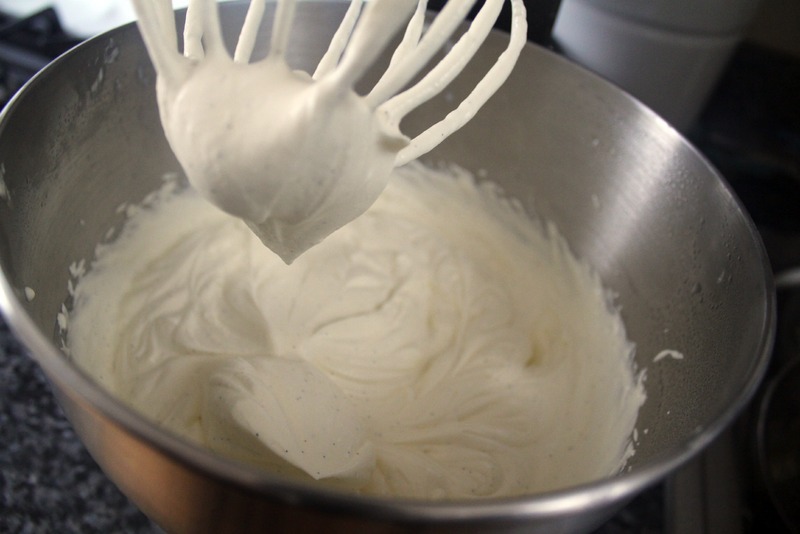 Measure out your 2 cups ofÂ cream. 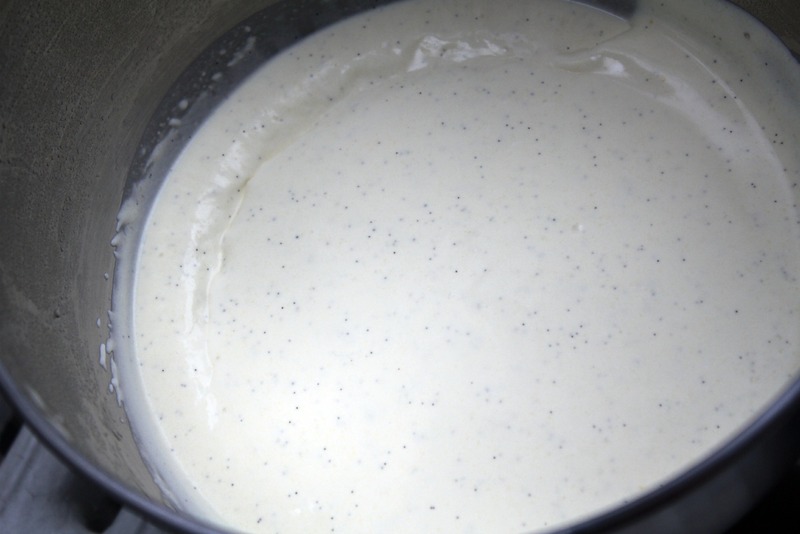 Pour the cream into the bowl sitting in the ice bath. Set a strainer on top. 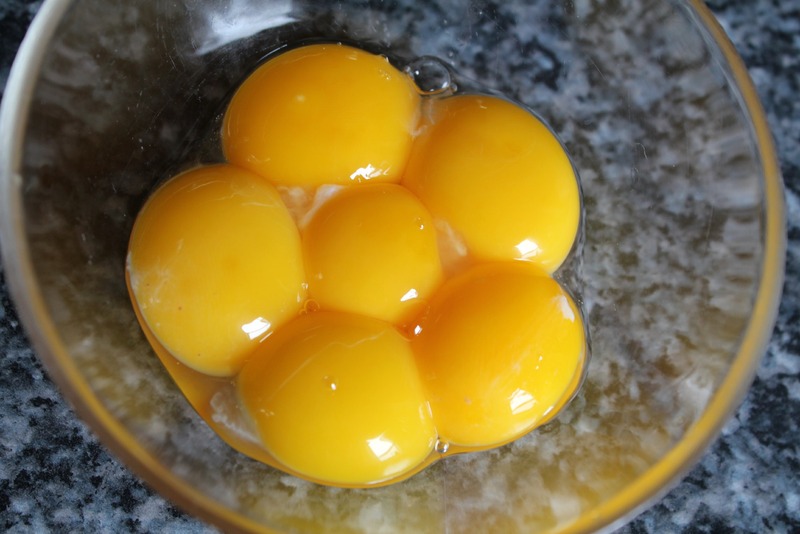 Keep the yolks in a bowl large enough to add liquid. 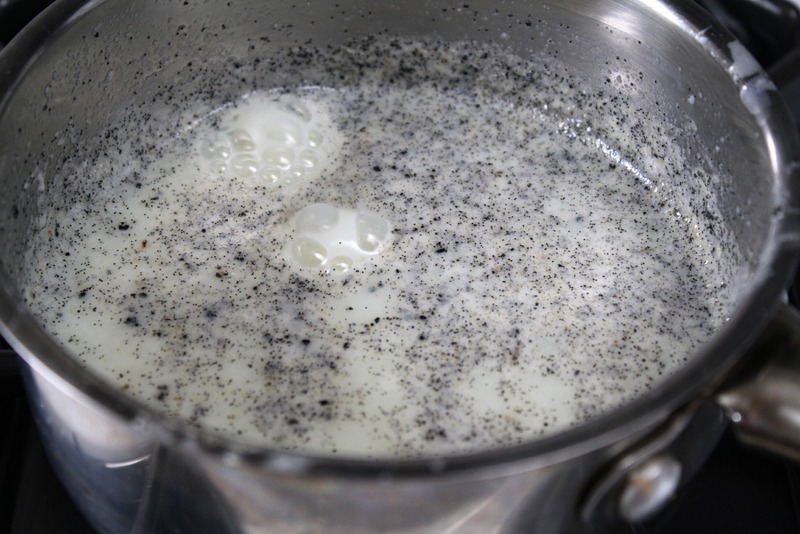 Now take your vanilla milk and warm up again on stove. 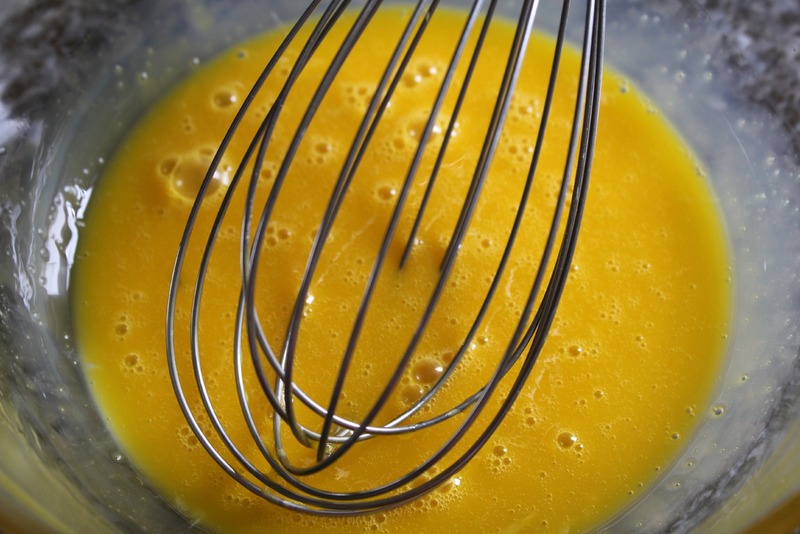 Slowly pour the milk into the egg yolks while whisking it. Add a little at a time. 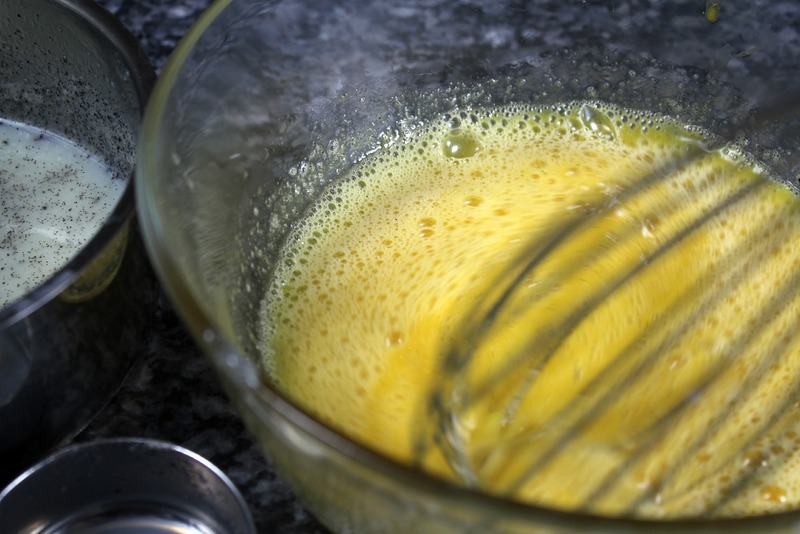 Don’t forget to whisk it while you pour. 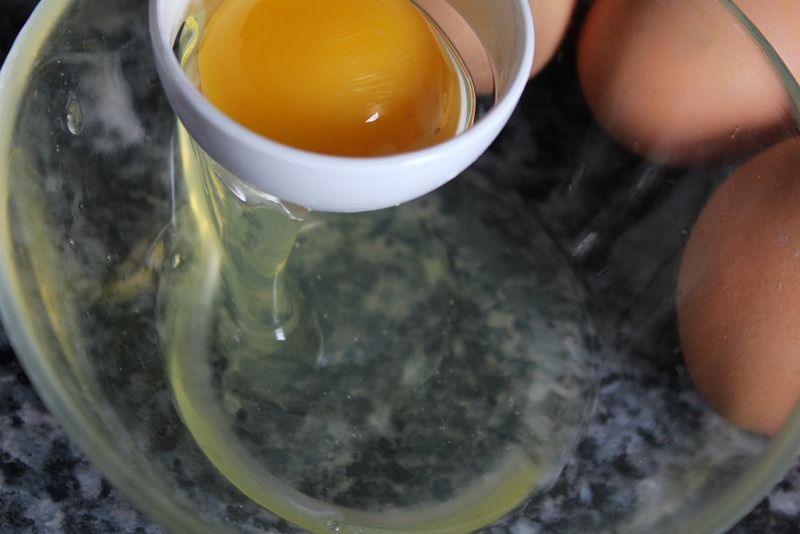 The reason that you gradually mix in the milk is so you don’t “cook” the eggs. 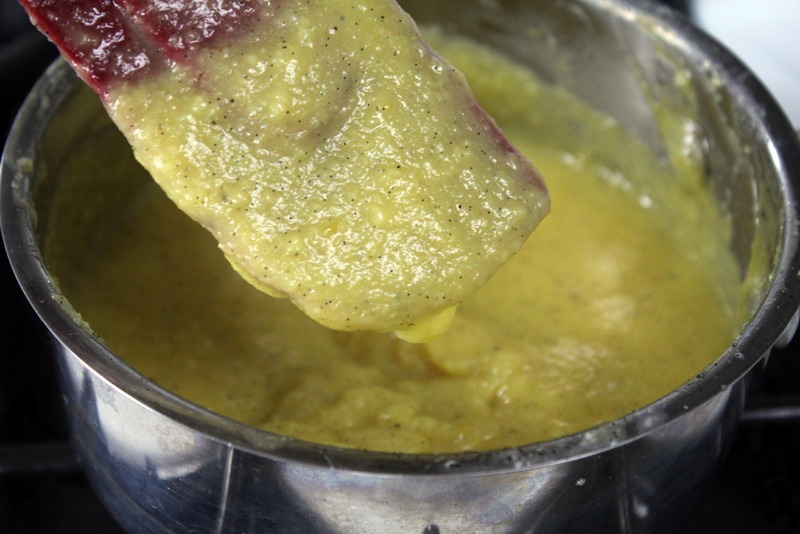 This is part ofÂ the process ofÂ making a custard that ensures a creamy ice cream. 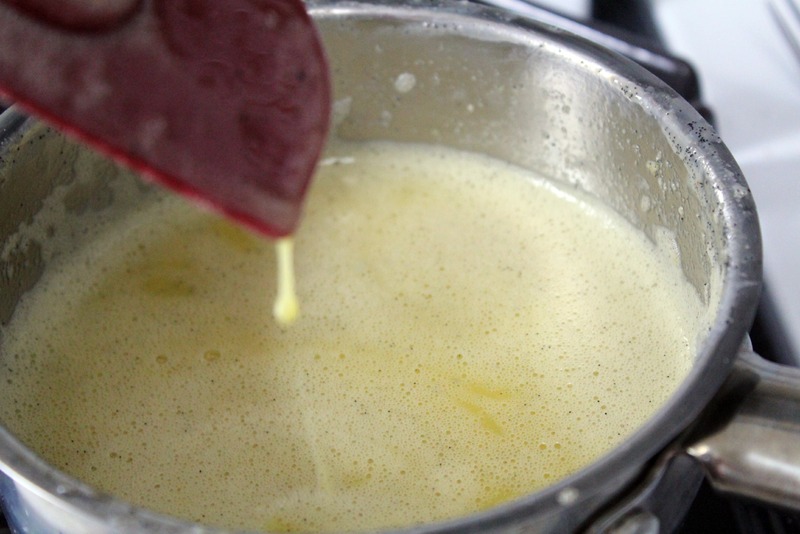 Pour your mixture back into pan and cook on medium to medium lowÂ heat. 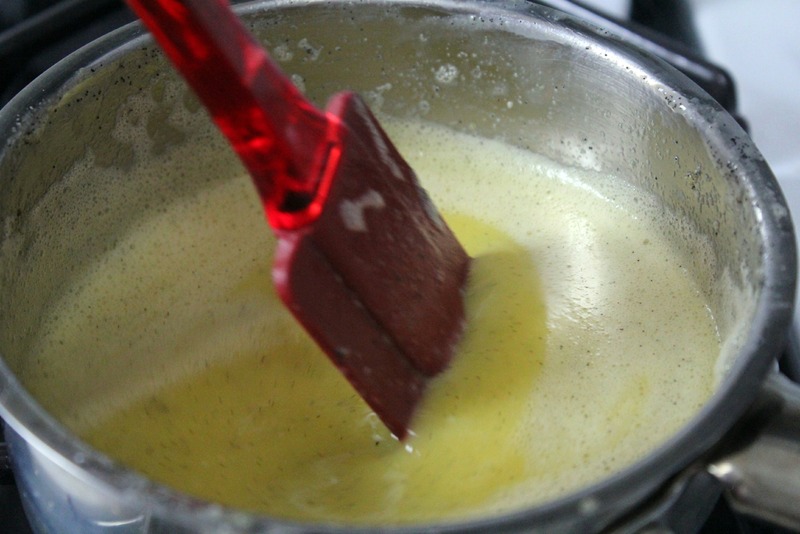 Notice how the liquid drips easily off of theÂ spatula. 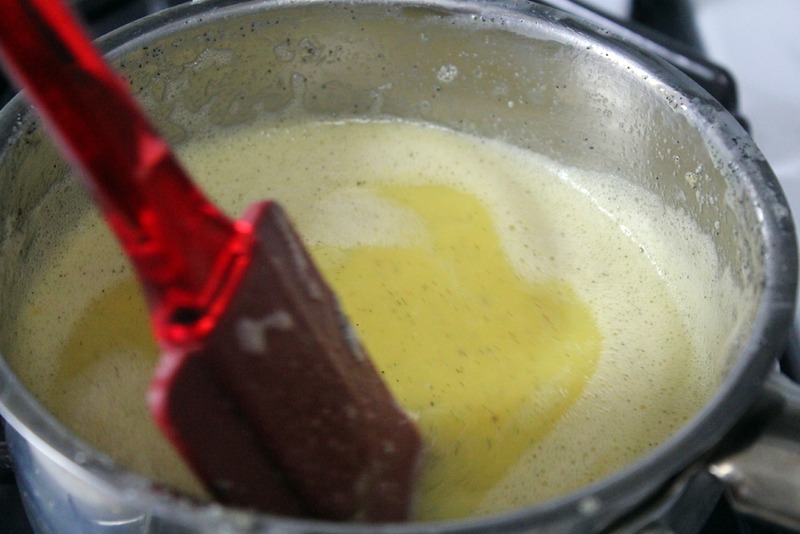 The custard is not yet thick enough. 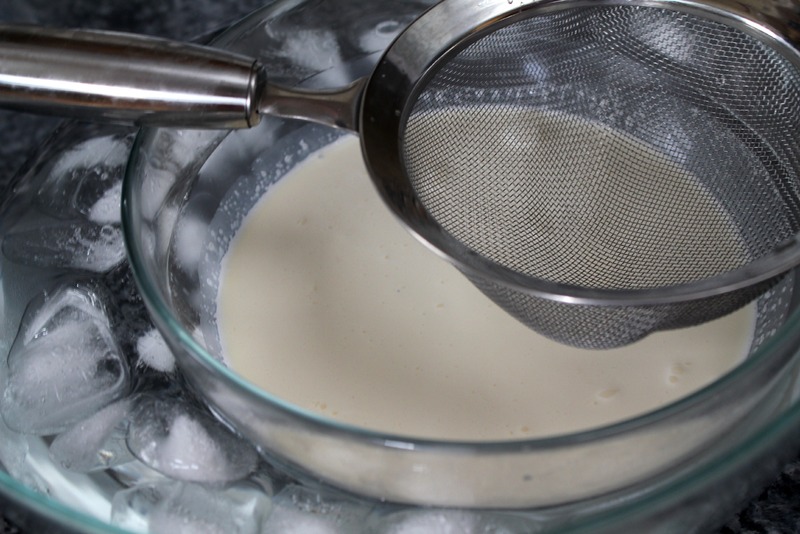 Now pour your custard into the strainer to get rid of lumps. 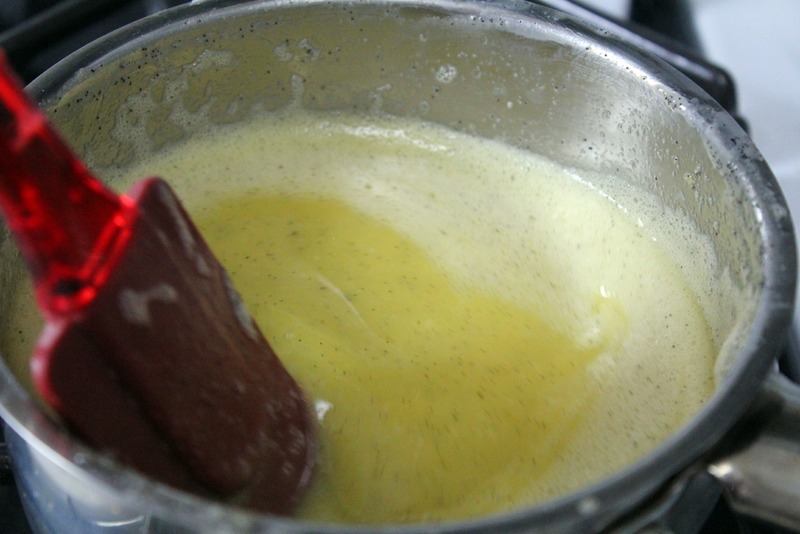 Â Mix the cream and custard. then pour into a bowl. 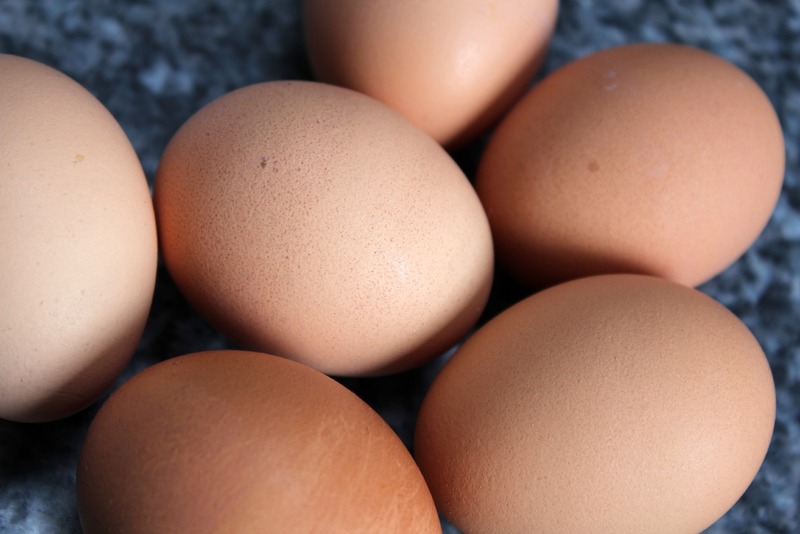 Cover and pop into your fridge. Chill for 1-2 hours, until cool throughout. 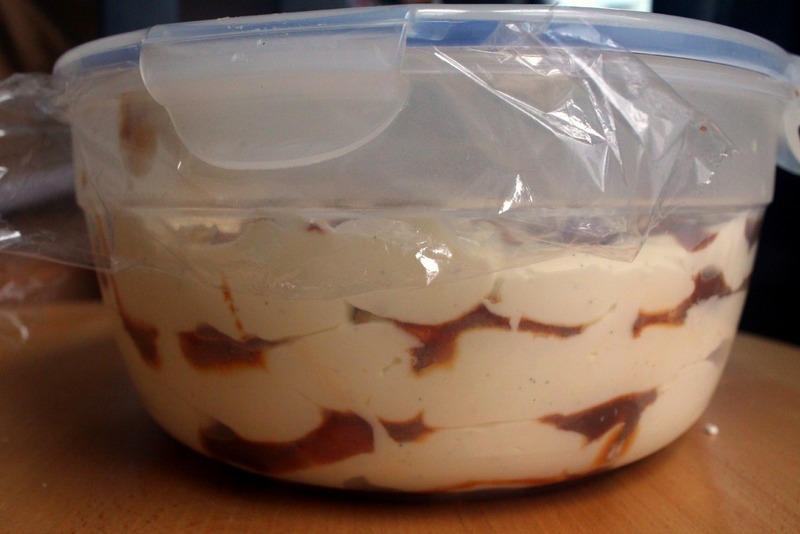 Move it to your freezer for about 30 minutes. Yes, my freezer is tiny. Yes, that chicken below is freezer burnt. It should start to freeze a little around the edges. 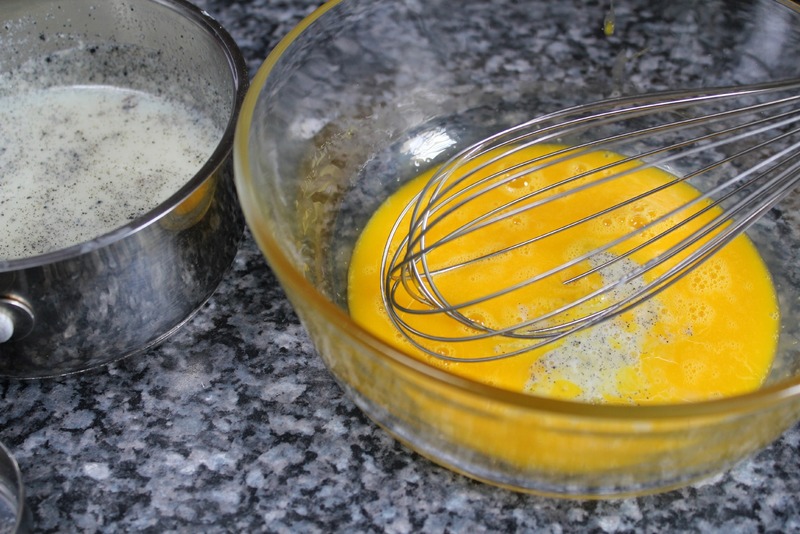 Take the bowl out and mix it with a mixer, or by hand with a whisk. 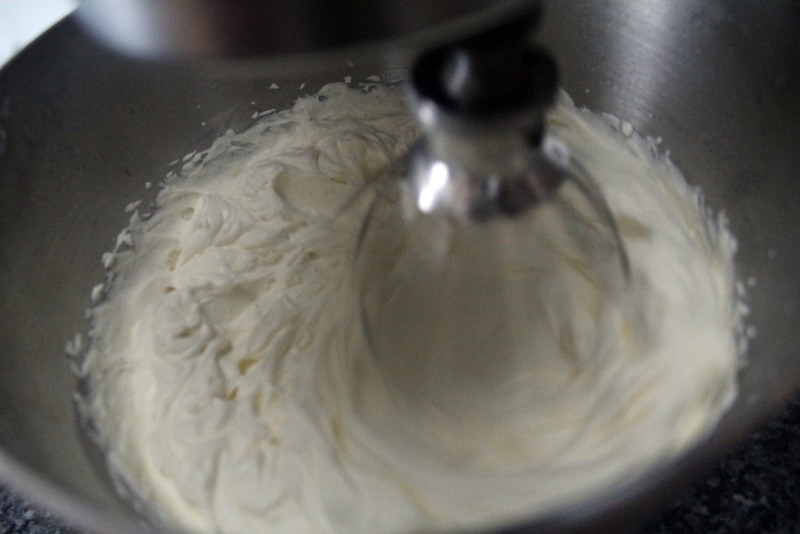 I used a stand alone mixer. Now pop it back into freezer for another 30 minutes. Take it out. Notice the edges are frozen here. Look how it is starting to thicken. Try a taste. Sooooooo good. 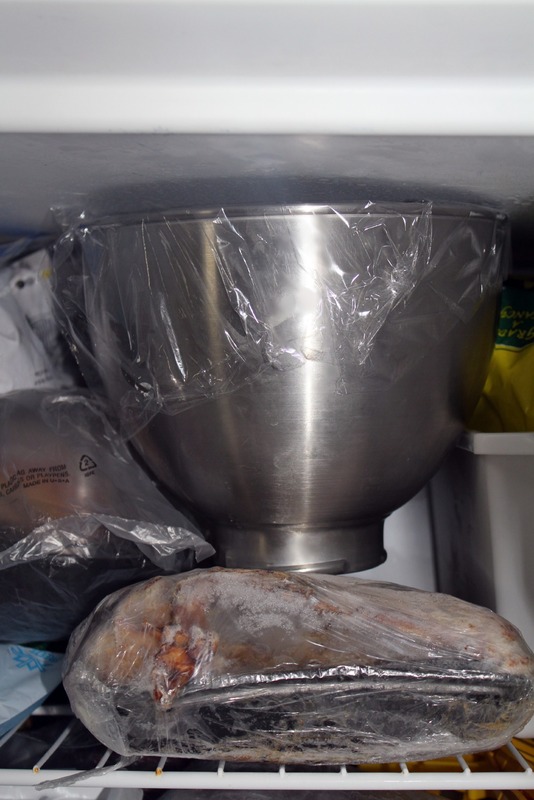 Place it back into the freezer one more finalÂ time. Why? The more you mix it in between periods of freezing, the more you break up the crystals. 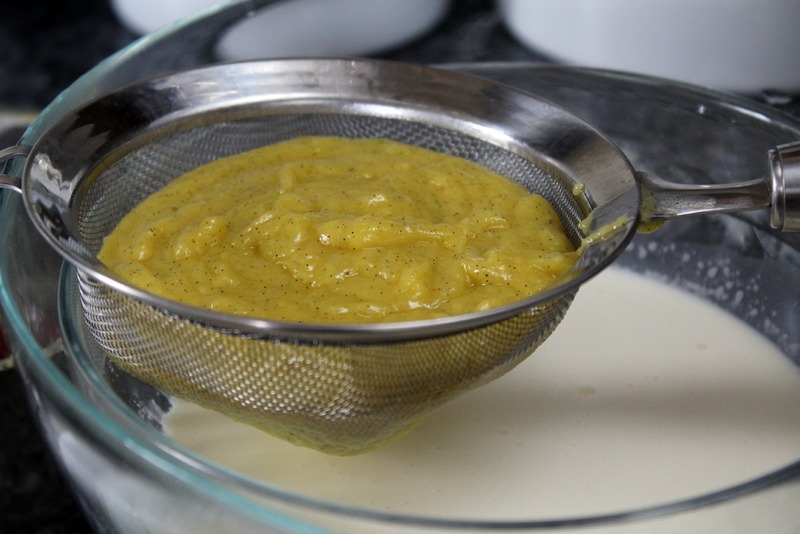 This makes the consistency silky and creamy. After the last 30 minutes, take it out and mix for the last time. Now prepare the mix-ins. Grab some caramel or ducle de leche (Spanish caramel). I chose dulce de leche because the flavor has something deep and rich about it that I prefer over caramel. 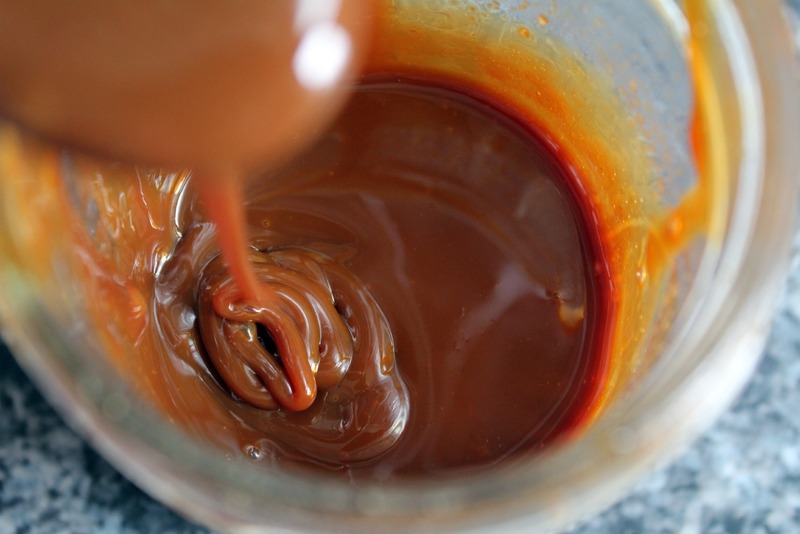 I make my dulce de leche from scratch. You can buy either at a store. 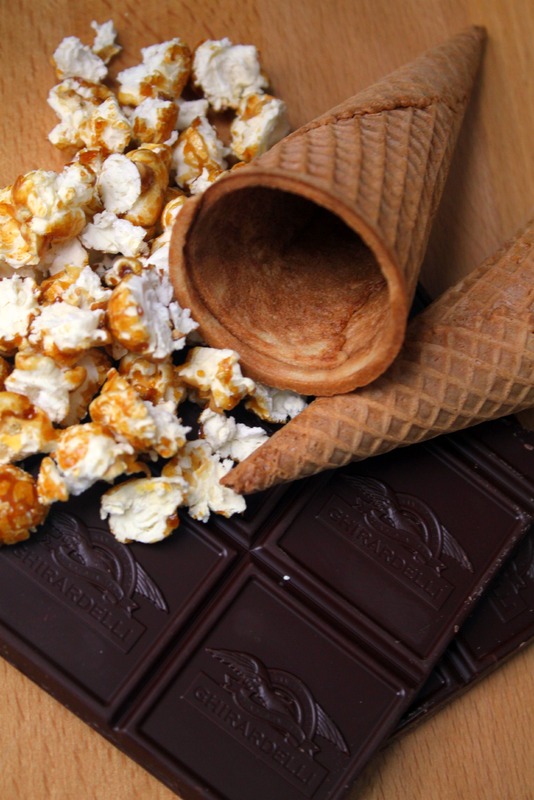 Chop up the Cracker Jacks into perfect little pieces so you get a taste in your ice cream, without too much chew. 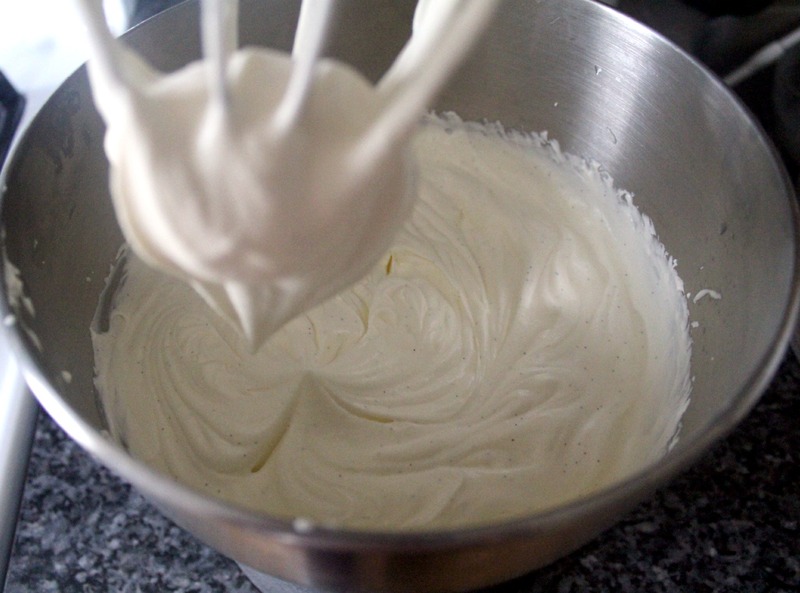 Now layer in a bowl. 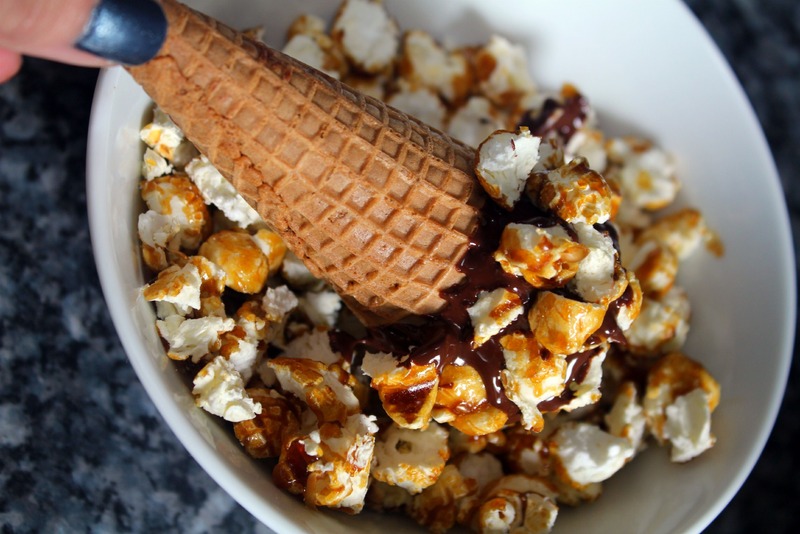 Swirl your caramel and sprinkle someÂ Cracker Jacks. Keep going until you run out of ice cream. See all of the layers? Good thing I don’t have to share this ice cream with anyone. I love the texture in this ice cream. The saltiness from the peanuts balance the sweetness of the Cracker Jacks. 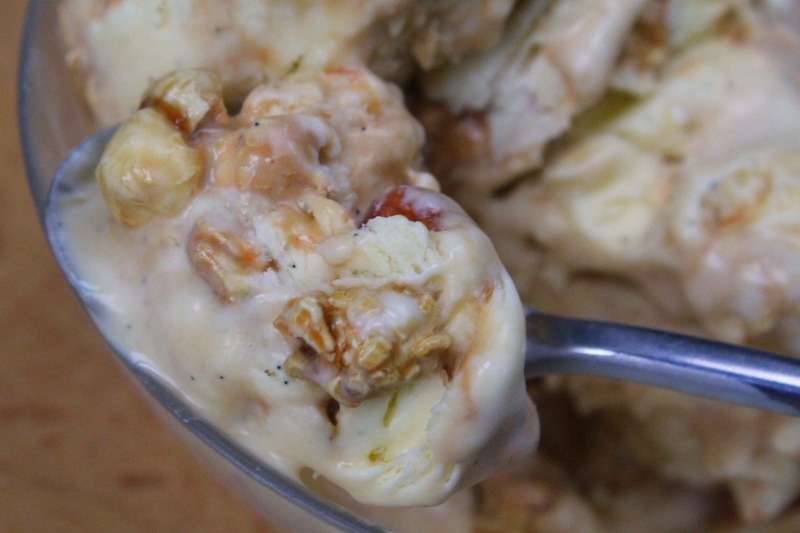 You have this smooth ice cream with light fluffy popcorn and crunchy peanuts. 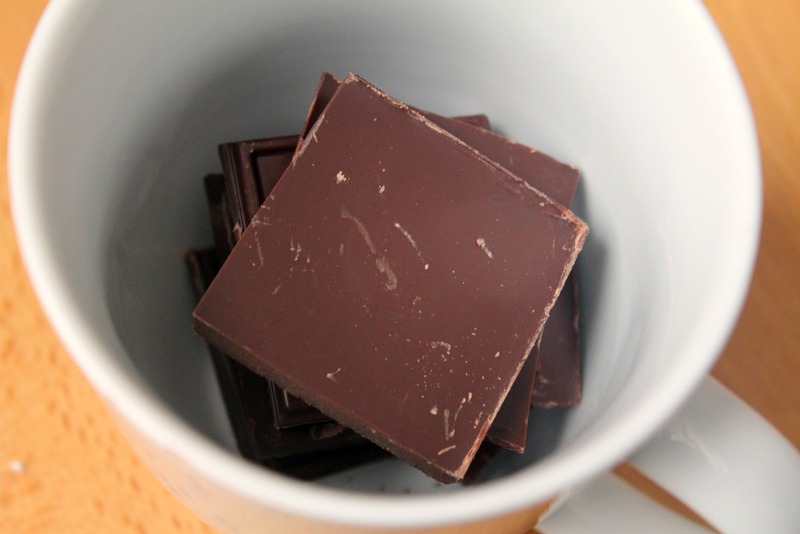 Break up a bar of semi-sweet chocolate. Place in a heat safe container. One that is deep enough to dip into. I used a mug. Ha ha, I just said doodoo. Let it cool for a couple of minutes. 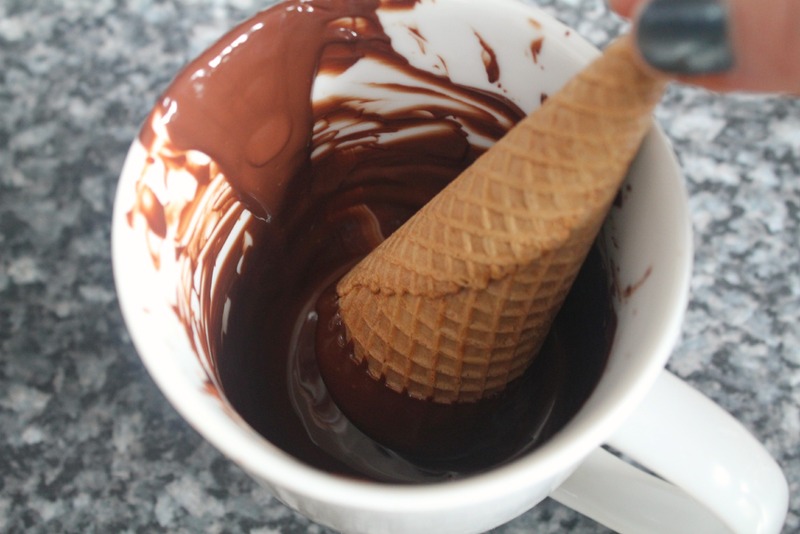 Then dip your sugar cone in. 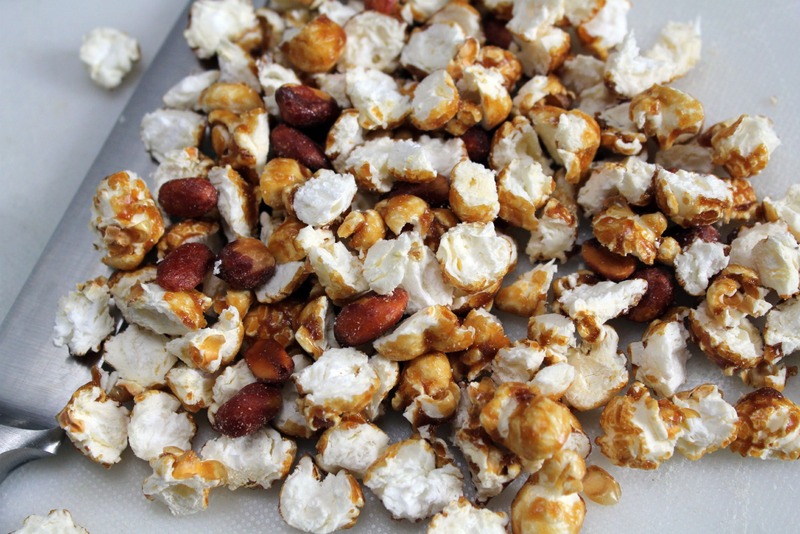 Let it thicken up around the rim, then roll it in the Cracker Jacks. If they are not sticking, feel free to lay it into the kernels, and use you hands to apply wherever they are not sticking on their own. Then place on parchment paper to dry. I foresee myself eating this on the couch while watching tomorrow night’s game, sans the overpriced tickets and cramped seats. This…this is a revelation. Thank you so much! 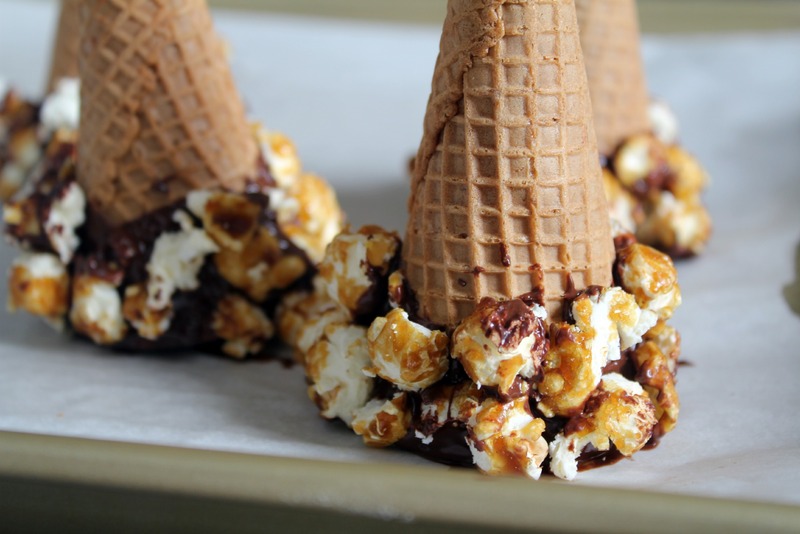 I’m going to make these next time I have summer guests I want to impress! When I saw this, I literally tried to eat my computer screen, I did not succeed. Niiiiice job Jas! This is super delicious. Bravo, very nice presentation you have here!! Reached your blog through Google. You know I will be signing up to your rss feed. “I like to use a timer, because I can barely remember where the car was last parked.”-this is toooooo funny! you’re adorable! 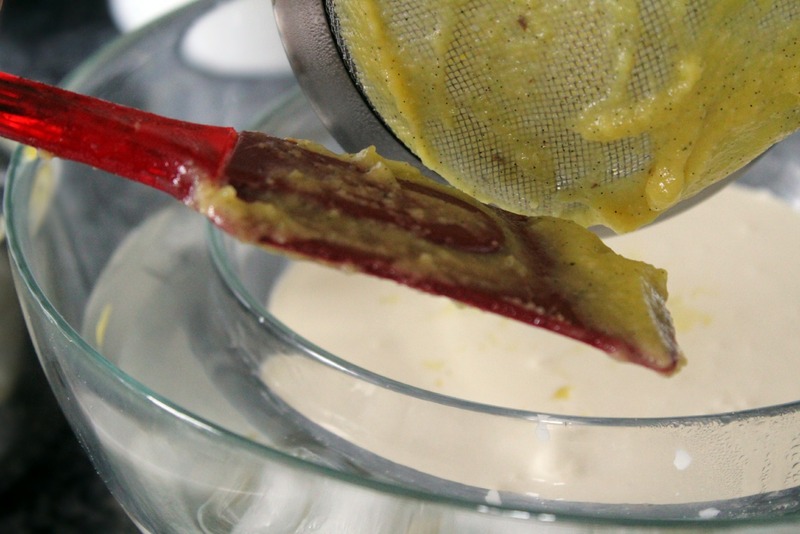 This recipe is amazing…definitely making once the weather warms up…thank you! Absolutely Love it! Your Pictures are Fantstic! You have inspired me to make my own Ice Cream! Wow..You are a Rockstar! Thank You! This is fantastic. What a clever idea and such amazing photos. Thanks for sharing. This entire presentation as well as the recipe is incredible. why aren’t you on the food channel??? This looks so fun and delicious! Buzzed this & am a new follower!!! My grandsons ALWAYS have company on weekends. THey think my cooking is totally awesome and love to come over just for the food. Wait until I pull this out this weekend. They won’t believe it.!! Thanks so much. Awesome pictures. Long time cultist, infrequent poster. 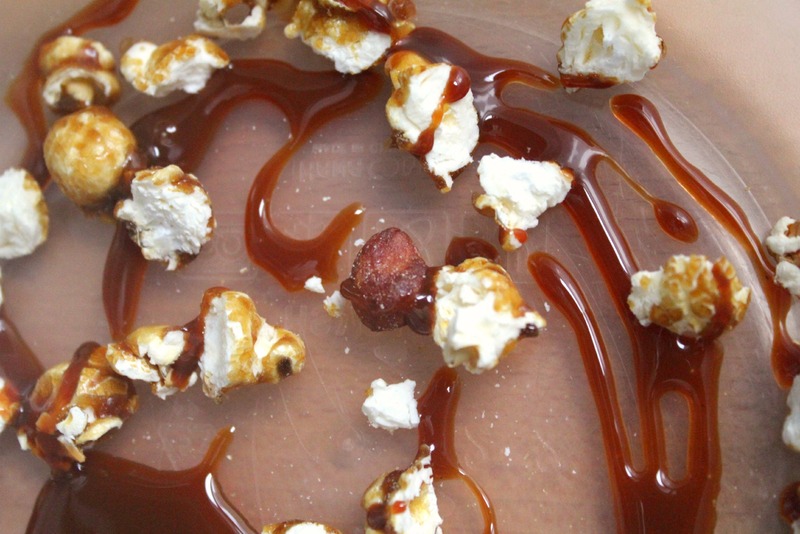 Could you do this with Caramel instead? 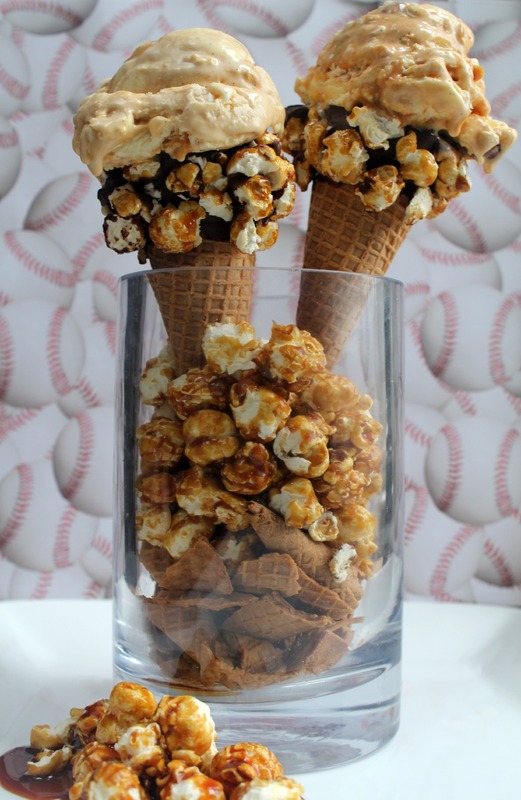 I know its not as pliable as chocolate but I would love it to be all caramel and peanuts and cracker jacks.